Love your smartphone? Love money? Well, hey now… this post is for you! If you’re looking for a convenient way to make money on the side, you’ll want to check out these apps. If you aren’t particular about your mobile screen saver, Locket can help you earn up to $250 a month. The app places ads, stories, viral videos, images, weather and other items on your lock screen. Think of it as a surprise every time you open your phone. You pick your interests when you sign up, so the content you see should hold some degree of appeal for you. When you see something that interests you, swipe left to see more content. If you like what you see, but you’re in a hurry to make a call or send a text, swipe up and you can look at it later. Not interested in an item, simply swipe right and you’ll be rid of it. Field Agent tasks usually pay $3-$12 each, says the company. A typical job might be going to a local store, taking a pic of a product, and answering questions about its price or placement. The app also offers paid consumer surveys. Payment is by PayPal or Dwolla. Get a $10 welcome bonus and rapid cash rebates from your Walmart, Target, and other purchases at over 300 retail locations. It’s free. Cash via PayPal, Venmo, or gift card (your preference) usually within 24 hours. Food Assistance Program purchases are eligible, too. The gigs for “Gigwalkers” pay $3 to $100 or more, says Gigwalk. User reviews suggest that most gigs range from $5-$20, though that may depend on location. A gig could be taking a product pic at a local store, or making sure that a marketing event is done on time. Didn’t see any recent mentions of $100 gigs, though that doesn’t mean they aren’t available. Payment is by PayPal. The Swagbucks mobile app has many different ways to make money, including surveys on products and businesses. Like other online rewards programs, Swagbucks won’t produce a big income, but is a way to get money on the side for extras or to help make ends meet. Like Gigwalk and Field Agent, gigs may involve “audits” (checking an item in a store), scavenger hunts (finding a specific product in a local store), or taking a photo of a storefront. Users report gigs averaging $2-$5 with time commitments of 10-20 minutes, though again this will depend on location. And as with Gigwalk and Field Agent, you’ll want to maximize your return by already being out of the house when you take a gig. Payment by PayPal. Get a $5 bonus just for signing up! Get paid for taking surveys, watching videos, signing up for offers, playing games, and other activities. Members must have at least $30.00 in their account in order to request payment, so build up your funds and cash out! Get paid for taking surveys on your smartphone. You can cash out once your account reaches at least $10. Payment via PayPal. Earn cash back when you purchase alcohol and scan receipts. Save money at any bar, restaurant or grocery store with discount shopping coupons. Try new drinks with local deals and other rewards. Find offers, make your purchase, upload your receipt. Once approved, your account will be credited. You can cash out with as little as $1. Similar to Locket, this app places content on your phone’s lock screen. This could include trending articles, flash sales, coupons, etc. Swipe left if it’s of interest, and earn 750 points. Swipe right if you are not interested, and still earn 50 points. Accumulate points and redeem rewards for cash or gift cards from your favorite retailers. 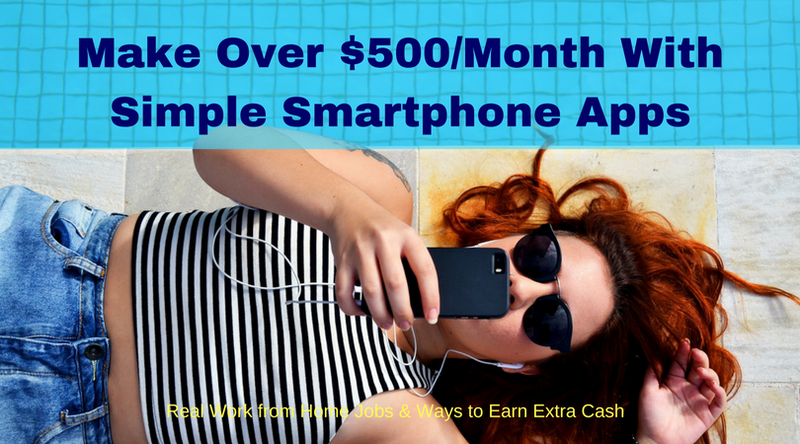 This entry was posted in Earn Extra Cash, Work at Home Jobs and tagged smart phone apps. Bookmark the permalink.